This form is used by an agent when agreeing to receive a fee to be paid by another broker for the referral of a person who needs the services of the other broker and their agents, to document the identity of the person referred and the terms for payment of the referral fee. Brokers and their agents often encounter prospective clients who need brokerage services beyond those the agent can or is willing to provide. These situations are often about the location of property the client wants or an expertise outside the broker’s scope of practice — a common scenario experienced by all professions. How agents best serve some clients is to refer them to another broker or agent known to them to be capable of providing the brokerage service the client needs. Thus, the agent making the referral properly asks for a fee from the brokerage office accepting the referral. The referral fee is earned when the client enters into a real estate transaction in which the other brokerage office is paid a fee. Licensed brokers and sales agents owe fiduciary duties to the principals they represent. Fiduciary duties require brokers and their agents to perform on behalf of their client with the utmost care and diligence, as a protective shield in transactions. Conversely, an unlicensed finder has no such fiduciary duty to members of the public. A finder’s function as an “agent” is limited to soliciting, identifying and referring potential real estate participants to brokers, agents or principals in exchange for the promise of a fee. They are locators, period. 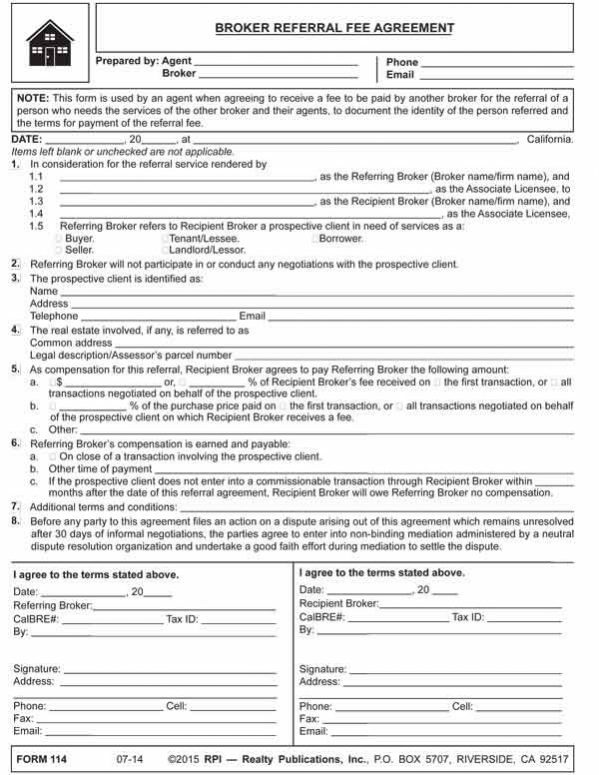 Although not licensed by the California Bureau of Real Estate (CalBRE) or accepted as members of any real estate trade association, finders are authorized by state codes to solicit prospective buyers, sellers, borrowers, lenders, tenants or landlords for referral to real estate brokers, agents or principals. Thus, they, as an occupation, provide leads about individuals who may become participants in real estate transactions. The referring broker will receive no other fees on transactions the referred prospective client enters into through the services of the other broker. Further, the referring broker and their agents undertake no activities after making the referral that create a fiduciary duty owed to the prospective client. Their involvement is limited to the referral of the prospective client only. Accordingly, a provision in the referral fee agreement states the referring broker will not advise or participate in any negotiations with the prospective client. when the fee will be paid. Thus, the written Broker Referral Fee Agreement serves as evidence of the terms agreed to for payment of the referral fee earned, which otherwise might not be fully clarified in an oral agreement, or worse, later forgotten.